It appears that I was worrying for nothing. 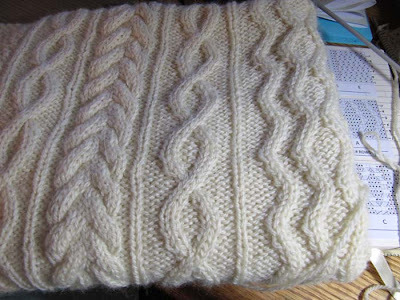 The blocked back of the Carmichael Aran is dry and I love the results. The size is exactly what I wanted, the stitches have evened out and there is no wool smell. I've decided that I really like this yarn. This back piece is now soft, without being limp, and very touchable. There's nothing so motivating as a bit of success and now I'm moving right along on the front piece. I think I'll have to make myself a sweater with this yarn one day. Yay for successful results. The yarn bloomed nicely now that it's dry. Did you also give it a light pressing?